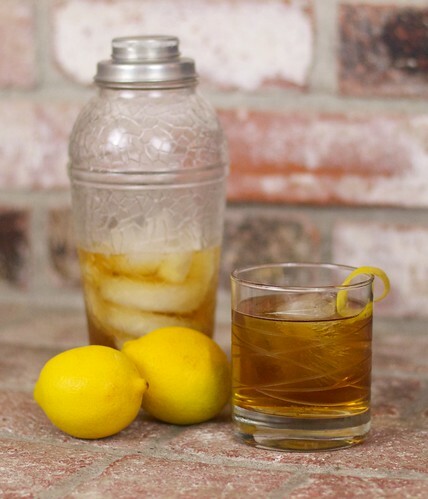 Fill a rocks glass with ice cubes and add the first three ingredients and stir to combine. Add the tonic water and lightly stir again. Garnish with a lemon twist. We actually tweaked the instructions a bit. I like having a huge ice cube in my rocks glass (to play with), so I put the first three ingredients in the bottom cocktail bar shaker with a lot of ice and stirred thoroughly before topping with the tonic water and gently stirring again. I then strain that into the rocks glass with the jumbo ice cube and garnish with the lemon twist. Like I said earlier, the drink is pretty unique and enjoyable. Somehow the bitterness of the tonic and the sweet citus of the curacao harmonize nicely with the smokiness of the scotch to make something a bit more whimsical than a Rob Roy without deviating into the frivolousness of novelty drinks. B and I have enjoyed this one now several times.